Love & Care Funerals supply a diverse range of caskets. Using only superior quality solid timber or custom board, every casket is built by professional craftsmen. Flat lid coffin with extra wide moulds on sides and lid. Single Raised Lid coffin with extra wide moulds on sides and lid. 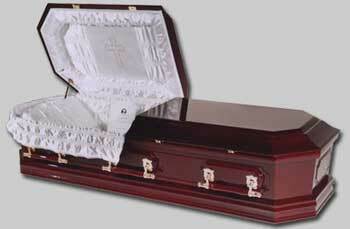 Double Raised Lid coffin with extra wide moulds on sides and lid. Single raised lid craftwood coffin, with routed cross in lid and decorative grooved moulds top and bottom. Partial dome single raised lid, Timber Veneered, with dome moulds top and bottom, and fancy pin. Groove to sides, ends and lid. Special contoured handles, Also comes with a Gift Box with Ceramic Roses. Solid Cedar semi domed lid coffin with panelled sides and ends , scallops and buttons. Single Raised Lid Coffin with gold pin groove to sides and ends plus rose. Solid timber casket, supplied fully trimmed with 4 long swingbar handles and presentation gift box containing either gold ceramic cross or gold eramic crucifix. Landcare Memorial included. Solid timber octagonal casket with plain pin grooves, to sides and ends. Supplied fully trimmed in white satin available with Greek Orthodox cross, Christian Cross or Chinese Long Life symbol, on both ends of the casket in gold pin groove. Plus same embroided in gold on lid trim. Full or half couch Landcare Memorial included.